LeEco repeats the usual marketing move: jabs at Apple's "lack of innovation"
If you've been following smartphone events closely for the past year, you've probably seen the names LeTV or LeEco being tossed around. Both point to the same thing — LeEco, formerly LeTV, is a China-based consumer electronics company, that offers streaming services, TV sets, smartphones, drones, and even has a first generation electric vehicle announced. 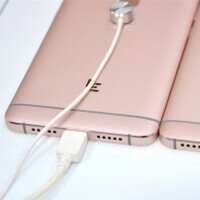 LeTV was in the news last year, when it announced the world's first USB Type-C smartphones — the LeTV One, One Pro, and LeTV Max — bound for international availability; and when it went ahead and openly called Apple an innovation Nazi, which stifles progress. A year later, we have a small re-run of the same tale. About a week ago, LeEco announced a refresh to its smartphone line – the Le 2, Le 2 Pro, and Le Max 2 are the first smartphones for 2016, which lack a 3.5 mm headphone jack. In a recent interview with CNBC, CEO and chairman of LeEco Jia Yueting talked about how Apple's products are outdated, due to obsolete designs, and rapidly aging software model. Mr. Jia quoted slumping sales of Apple products in China, and stated that this is due to the fact that Apple has long stopped innovation and has been trumping on the same spot for a while now — the recently released iPhone SE, which is a re-packed and upgraded iPhone 5s, being proof of that. According to LeEco's CEO, the smartphone industry now needs products that put “Internet first” and are connected to a wide ecosystem. In his opinion, Apple's iPhone needs to drop the closed ecosystem model if it is to continue growing. If we are to be honest, we are having a hard time getting what Mr. Jia is trying to say. There are a lot of IoT devices, as well as various physical hardware gadgets made to work specifically and exclusively with the iPhone. Thanks to its wide adoption by customers and relatively un-fragmented nature, due to timely software updates for a wide range of active iPhones, manufacturers and developers within the industry have long preferred to make stuff either exclusively for iOS, or for both iOS and Android. While a slow-down of iPhone 6s sales is not hard to imagine 8 months after the phone has been launched, lead times on iPhone SE orders show that the mini handset is not exactly undesired by customers. Tim Cook's last statement about the Eastern market said that Apple is still “very bullish in China”, thanks to the growing middle class. In any case, the company should be releasing its Q2 fiscal earnings report later today, which may throw some light on how much, exactly, it's “struggling”. Bulls**ts! All businesses envy Apple ability to generate profit. And you know this because you talked to all those businesses. All businesses want to make money. What many fo them don't understand, liek for example Samsung, is how Samsung is working hard to actually bring innovative features to their phones and they have rough sales, while Apple doesn't do s**t and gets high sales. Samsung has high sales too. I don;t thing Samsung is looking for the S to sell 200M phones. If they did, they woudl stop selling 200M of those medium and low-end phones and just sell the Note and S, which would get 200M+ sales per year. Samsung just doesn't have the US recognition on all their products in the US. But that is changing. Many apartments I see begin renovated are being decked out in Samsung appliances, there phones sales are only second to Apple. You should expect that a local business should sell more product in it's home country. Something Samsung themselves struggle with. But these new guys should actually just be following Samsung. Samsung hasn't copied Apple in several years. In fact they haven't really since the original S, with exception to the latest Galaxy Tab S2. Talking about Apple, isn't goign to help their sales. Its best to run an ad showing how what you have is better and let the customers decide. If it is, people will buy it. These brands just need to work on making their brand stronger, so when Apple continues to get weaker, these brands can just keep moving forward. This is what we saw in the desktop market and it will happen in the smartphoen market too. Samsung Appliance for home is crap. Two friend paid the price.. One got a cloth washing machine ( might not have the right word lol ) From Samsung and its died after 3 years... Another friend got the fridge and its having load of issue... So no thanks. my kitchen and living room filled with those samsung's crap.. and all work perfectly, never claim any samsung's warranty so far..
You are in which world dude? Samsung home appliances are one of the best in the market. There is little doubt today about samsung's technical prowess(unlike stale apple). Samsung appliances are second to none, they sell from cheap to most expensive washing machines and my family and i have own 3 so far from cheap to expensive and they all work well, and only 1 maintenance needed so far. Also, my LED tv from samsung has been doing well so far, yes it's a little pricy but it works wonder. No warranty claimed so far. Your point is? True.. not every company can make fool of such large population. What? Because you removed the headphone jack first? Also I think it is a drawback as we can not charge and listen music at a time. Innovation ! Apple will make it a revolition ! It's a backwards world where yet another Android OEM has the gall to suggest Apple isn't innovative. How about some software innovation LeCon? Apple are the most innovative tech company on the planet at preset. Only Google comes anywhere near to them in that regard, but Google have only seen the level of success they have because they give stuff away for free. Lol at innovative tech company on the planet. Please enlighten us. No Apple is not. Name something Apple has innovated? I wish you the best. https://www.youtube.com/watch?v=P9r5ZkXyoPc - Apple latest innovation! https://www.youtube.com/watch?v=AZb-7mtNYgA https://www.youtube.com/watch?v=SaFJi8e3Phw https://www.youtube.com/watch?v=oL1xf_X0W2s All those videos are facts about the recent Apple we talk about everyday, done in a very humorous way. But a fact is a fact no matter how its presented. It wont matter to many, but it doesn't change the reality. iPod, iTunes, iPhone, iPad, all innovative products that shaped the entire market that followed them. Sounds pretty innovative to me. The fact is bruh, Microsoft is still way ahead of the majority of tech companies on the planet. Microsoft has the most technology being used by tech companies in the world. When iot comes to phones, and computers and many other tech-toys, Microsoft technologies exist in more of them, than any other tech company on the planet. I don't know what planet you are on, that you think Apple is so innovative. Unless you are being sarcastic, then HAHA...very good joke. Apple are far from the most innovative tech company on the planet, they spend smaller amounts on R&D than its rivals and its products are years behind. They have been copying both hardware and software ideas for years now and rely renaming existing tech to make it sound innovative supported by marketing to sell its products. Google spend much more than Apple. If we compare Apple to Apple ( pun intended ) As Apple do the software and hardware you take the spending they do thats your total for Apple. Then you take the R&D of all android OEM put it together with google thats your second total. Wich side spent the most ? Google doesn't make any smartphones. I don't really qualify them in a conversation about phone manufacturers. And it makes no sense to consider all android OEM's as one entity because these companies are competing with one another. They are not sharing development costs. Generally. They borrow from one another, but that is absolutely not the same thing. You should also keep in mind that Google has an inherently different relationship with Apple than any android OEM. Google wants its services on as many devices as possible, and as such they don't really compete with Apple in the sense that say, Samsung would. Even Apple sees Google in a way that Google does not see Apple. mrochester i would recommend stoping drinking the Apple koolaid its destroying your brain. There is not much innovation from apple compared to other OEM since 6 years easily. For these new an upcoming OEM's, there rise doesn't mean they have to attack Apple. many people know Apple has never really had any innovative ideas. Beating Apple is simple. Make a better product, bring something new to the table, and don't overcharge for it. They hate on Apple, but are sooo jealous of Apples success. Even Apples down quarters destroy their whole year. Yeah, because its smart to compare a company earning that have been around for over 30 years, to one that's one a few years old. One who has an established customer base vs one just getting off the ground. Because somehow, everything in he world has to be about money. Many companies actually want to bring good products to customers and actually earn the money vs using marketing tricks and selling them 3 year old hardware at top dollar...because people are so s**t-stupid, they cant tell what actually is better vs what is actually better. Money isnt every bruh. Ask RIM, Nokia, Palm and many others. You're even more of an idiot than I thought you were, if you think the bottom line isn't what matters most to these companies, and I think you're a huge idiot. they spend less money on R&D which is why their products look exactly the same every year, they don't pay any stock dividends, they tax dodge by keeping all their money off-shore and held in bogus accounts, they are only managing 3 products, they have less overhead because they out-source everything. Apple makes smarter money buy not doing anything themselves. That's how you increase profits. For all this money you keep bragging about, they still put 16GB of storage into a phone with 4K recording. HAH! Apple isn't paying you any money, so why do you give a s**t about what they make?! Any corporation will always have more money than me, so I can'1 be jealous. I dont need that kind of money. I own my own business bruh. I have everything I ever wanted and then some. But its nothign to brag about. Why? BEcause others have it too and many way more. I am blessed an happy. Money means nothign to me. I need it to live in this world. If I didnt need money to live here, I wouldnt have any. Just like businesses in general.